We are pleased to Announce that the U.S. Department of Commerce, Minority Business Development Agency (MBDA) is supporting the African Union Expo and Martin Ezemma, MBDA Business Development Specialist, the Agency’s expert in the African Diaspora will be leading the Q&A discussions and his extended team will be delivering several of the sessions related to Exports/Imports, Trade and Investment. The Minority Business Development Agency (MBDA), a job-creating agency, leads Federal efforts to promote the growth and global competitiveness of America’s minority business community. This summary includes a small portion of our overall accomplishments during the first three years of the Obama Administration. substantial contributors to exports in manufacturing, retail trade, technology, and educational services. 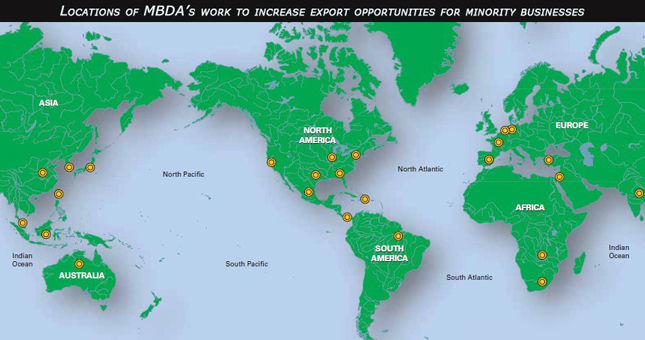 In 2011, MBDA successfully launched a redesigned MBDA Business Center program. The new nationally focused program combined the traditional Minority Business Enterprise Center (MBEC) and Minority Business Opportunity Center (MBOC) programs into one. Significant changes include an increase in funding and the elimination of geographic borders, allowing business centers to provide services to minority-owned businesses anywhere in the Nation. Additional changes include longer funding terms, reduced paperwork burdens, the addition of merger, acquisition, joint venture and strategic partnering support, and enhanced export services.